I run 205 / 70/ 14 Dunlop SP LM 703 made in Indonesia. They squeal a little too much for my liking around corners. Anyone had recent experience with Serbian XWX Michelins? Are they like the original French made ones? The car runs 14 inch alloys. A couple of years ago was thinking of upgrading to 15 inch Benz alloys. I rang Benz and they told me $3000 per rim plus VAT!!! They are a lot cheaper now as they are re-manufacturing them. From memory around $500 per corner when they run one of the specials they do a few times a year. Here’s some new ones thatve just become available again. Same as some Corvettes... Not sure about speed or load rating yet. 99W so more than enough... $289ea. 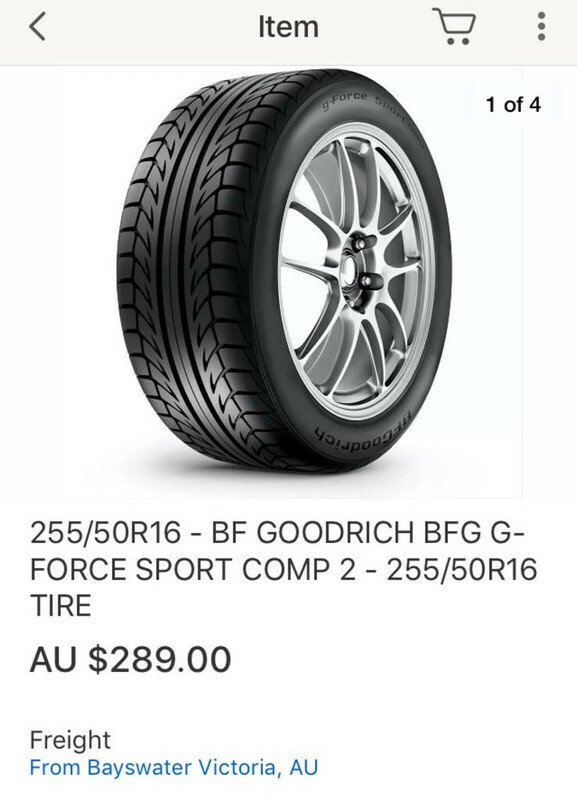 I know what I've paid for tires (tyres) in the past here and just had to look this up. Same models I've seen so far as low as $91.99 each. Goodrich themselves are running them for $121.99 each. I seriously put some thought into a rim business a time or two. I can never get over the price differentials in different countries. Last edited by BHW; 19th October 2018 at 03:51 PM. N.B. Oh, I forgot Mercedes Benz and the majority of Car Companies with their cost of spare parts. Freight is usually the issue with larger items sourced OS. Wheels or tyres can be very $$$$ to transport and even if you can pick them up cheap it adds up in the end. I use myus.com, and find it pretty good although have never sent something as big as wheels/tyres. It should be noted that they now collect GST on behalf of the AU govt, so this adds to the cost of their service.